certification for ISO 9001 HACCP 22001 ISO 9001:2000 Delhi, India Certification certification Mumbai Delhi at cheapest rates. ISO Quality Certificate certification. Is Your Organization Concerned ? conformance to international standards ? From Commodity To Branded Product ? Hazard Analysis and Critical Central Point (HACCP) / ISO 22000 Food Safety Management System is a process control system designed to identify and prevent microbial and other hazards in food production and entire food chain. HACCP includes steps designed to prevent problems before they occur and to correct deviations through a systematic way as soon as they are detected. Such preventive control systems with documentation and verification are widely recognized by scientific authorities and international organizations as the most effective approach available for producing safe food. HACCP / ISO 22000 enables the producers, processors, distributors, exporters, etc, of food products to utilize technical resources efficiently and in a cost effective manner in assuring food safety. Can help identify process improvements. Reduces the need for, and the cost of end product testing. Is complementary to quality management systems such as ISO 9000. Provides evidence of due diligence. Reduces the likelihood of product recall adverse publicity. Enhances customer satisfaction / reduces dissatisfaction. 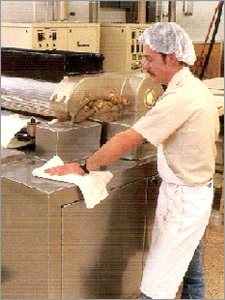 Facilitates better understanding of food packaging safety issues throughout the organization. Improves staff performance through the promotion of team spirit. Improves staff morale and motivation through a cleaner working environment. 2. Determine the critical control points. 6. 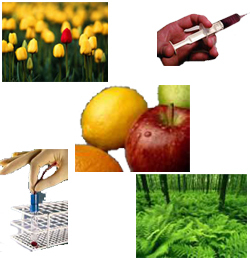 Establish procedures for verification to confirm that the HACCP system is under control. "A world leading Certification Body organization can provide you professional & reliable services. ISO Certification Company is a world leading ISO Registration organization specialized in global product & system certifications such as: US FDA compliance, UL mark; European Union & EFTA product safety requirement- CE Marking, ROHS compliance, China Compulsory Certification- CCC Mark, ISO standards, HACCP, OHSAS, C-TPAT, KAIZEN, GMP, EUREPGAP, Six sigma, SA 8000, BSCI, WRAP etc. We provide our services in India and other parts of Asia We give our services for the following areas: UTTAR PRADESH - Ghaziabad, Kanpur, Allahabad, Lucknow, Agra, Meerut, Varanasi, Bhadoi, Rampur, Noida, NEW DELHI, CHANDIGARH, HARYANA -Panchkula, Faridabad, Gurgaon, Bahadurgarh, Bhiwadi, Panipat, UTTRANCHAL- Mandi, Baddi, GUJARAT - Ahmedabad, Surat, Bhavnagar MAHARASHTRA - Mumbai, Nagpur, Pune JAMMU & KASHMIR - Jammu, PUNJAB - Ludhiana, Faridkot, Amritsar, Chandigarh KARNATAKA - Bangalore, Tumkur, Mysore, TAMIL NADU - Chennai, Tirupur, ANDHRA PRADESH - Hyderabad, MADHYA PRADESH- Bhopal, ORISSA - Raurkela, Bhuwneshwar, Katak WESTBANGOL- Kolkata, Durgapur BIHAR- Patna, Gaya, JHARKHAND- Ranchi. Jamshedpur. A world-leading ISO Registration offers you excellent services at very reasonable prices!"